Hakeem Butler – Worth the Hype? The biggest plus side that Hakeem Butler has is his size. At 6’5″, 227 pounds, Butler creates a physical mismatch anywhere on the field. He also is fast. He ran his combine 40-yard dash at 4.48 seconds. When his speed and size are coupled together, the receiver can be a deadly playmaker. Butler has that playmaker ability. He can go deep and catch long range passes. He does this well, and even showed off his sideline, toe-tapping abilities in the Texas game tape I watched. He can be the biggest playmaker on the field. Butler is also versatile. For a massive man, he controls his body very well. This allows him to run a full route tree. You will find him running the everyday slant, the go route, the out route, the post route, comebacks, and more. All with ease. His routes are run well and he is able to exhibit all his best abilities in this range. Also, although he does not excel at blocking, Butler also shows that he is willing to attempt it. Hakeem Butler has a case of the dropsies. A bad one… While watching his tape, it became apparent that Butler was not a reliable target. Not only did he drop contested catches, but uncontested ones as well. These drops did not occur as irregularities, they were a constant fixture of his play style. Butler dropped 12 passes in 2018, which rendered him a drop rate of 16.7%. Butler’s issue with drops appears to stem from a lack of concentration, but it is hard to pinpoint the issue. Whether or not it is curable at the NFL level is debatable. Plenty of receivers come into the league with an unwanted tendency to drop the ball and never progress past it. Aside from his drop issues, Butler has other weaknesses that need to be addressed. He appears to play slower than he should. Despite his 4.48 second 40-yard dash time, Butler often gets stuck in coverage and fails to escape. This is not because his opponents are very high caliber either. Big 12 defenses are notorious for being bad. The Big 12 (the conference he played in) is filled with teams that exploit bad defenses in the air attack. Points often escalate like an arms race. In some games (like against TCU) he is shut down for no particular reason at all. And then, against better opponents like Texas, he erupts. The inconsistency in play is a major problem, and whatever team drafts Butler can expect it at the next level. Hakeem Butler is without a doubt a flawed prospect that is being graded too highly by many analysts. But, Butler does show enough promise for me to believe that he can develop into a solid wide receiver. Make no mistake, Butler has plenty of talent. The talent is worthy and the measurables alone are worth a roster spot. If the right team gets Butler, he can develop into a good wide receiver. The team that drafts him, though, must understand that they will get a developmental player, not an immediate starter that a first round grade requires. 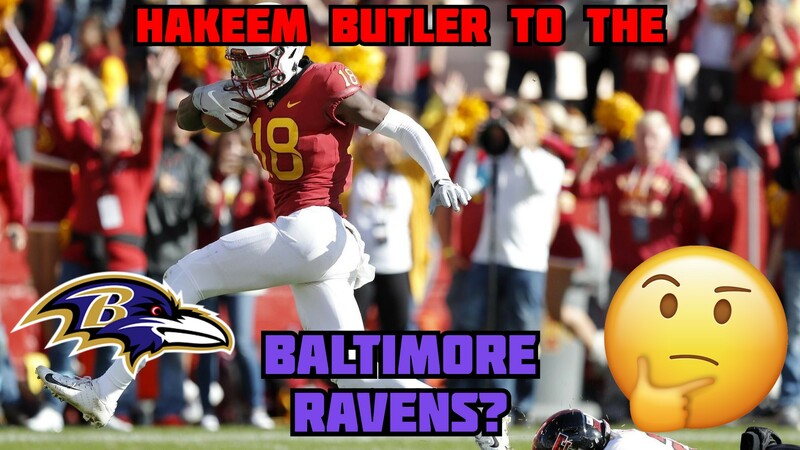 Should the Ravens Draft Hakeem Butler? Only in the third round should the Baltimore Ravens draft Hakeem Butler. Many analysts are currently predicting that Butler will either be selected in the late first round or early second round. I believe that this evaluation is too generous. His drop issues are enough for me to knock him down a round, but his other inconsistencies are concerning as well. There is no question that Butler is talented and has the potential to develop into a good wide receiver. But right now, Butler is not polished enough to step into a starting role and compete at a high level.